Søren Kierkegaard (1813-1855), Danish philosopher and author Søren Kierkegaard was born on May 5, 1813 in Copenhagen. He was the youngest child of seven, born to parents of Jutlandish descent. He sometimes called himself a child of old age because his mother was 45 and his father 56 when he was born. Kierkegaard was influenced early in life by the devoutly religious teachings of his father which concentrated on Christ's suffering. In 1830 Kierkegaard went to study theology, philosophy and literature at the University of Copenhagen. In 1834 his mother died, and he began the famous journal that he would keep for 20 years. He had decided that he must know himself before he could know what he would do with his life. In 1837 he moved away from home to work teaching Latin at Borgerdydskolen. In 1838 his father died.In 1840 he became engaged to Regine Olsen, a woman he had known since he had first moved away from home. He broke the engagement soon thereafter, however, believing that domestic responsibility would hinder him in his philosophical calling. He entered into a life of seclusion, writing and publishing constantly for the next ten years. In 1840 Kierkegaard completed his doctoral dissertation entitled The Concept of Irony. Kierkegaard's first major book was this dissertation, published in 1841. This, along with many of his other books, was in conflict with Hegelianism, the dominant German philosophy of the time. Contrary to Hegel, Kierkegaard believed in personal immortality, and that human life cannot be rationalized in the way that Hegel's system would understand it. Kierkegaard argued that belief in God is a free act of faith, not a solution to a theoretical problem. 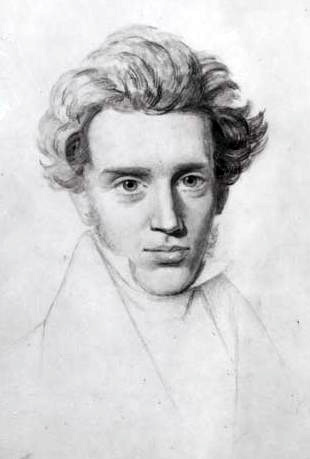 Much of Kierkegaard's work expresses a deep interest in religious issues, including Fear and Trembling (1843), The Concept of Dread (1844), Purity of Heart is to Will One Thing(1847), and The Sickness unto Death (1849). Most of Kierkegaard's early writings were published under pseudonyms, and the "authors" didn't necessarily always agree with one another. At the beginning of his career he wanted to avoid committing to a single definitive religious or philosophical position. In 1848 Kierkegaard had a spiritual crisis. His works after this point began to bluntly attack the church and Christendom's complacency. He hoped to anger his contemporary Christians enough to inspire in them a stronger relationship to their faith. In 1850 he published Practice in Christianity, under the pseudonym Anti-Climacus. He felt this to be his most important book, and saw it as a reintroduction of Christianity. He felt that the removal of the offense of Christianity by the state church of Denmark made light of the message of Christianity. He also wrote articles for a journal called The Fatherland criticizing the state Lutheran church for claiming that all people born in Denmark are automatically Christian. These articles are compiled under the title Attack Upon "Christendom,"While he was writing these articles , Kierkegaard was stricken with a spinal disease. He died within a month of his diagnosis on November 11, 1855.